Amity by Micol Ostow. Egmont USA. Reviewed from ARC; publication date August 2014. It's not yet August, but I can't wait to say how much I loved Amity. Amity is about a haunted house; a house that is both haunted and that haunts its unfortunate inhabitants. It is told by two seventeen year olds, Connor and Gwen. Both have just moved into a new house. It is the same house, ten years apart. And both see what those around them cannot, or will not: that there is something wrong and dangerous about Amity. Reader, it scared the hell out of me. The title, Amity, refers to another story about a haunted house, The Amityville Horror. But rest assured: the reader doesn't have to know anything about that (maybe) true story. The setting has changed, from Long Island to New England. Amity is the name of the house itself, not the town. It's isolated, not in the middle of a town. What hasn't changed? The house is haunted. There are things, some small, some less so, that those who have read about The Amityville Horror will recognize. Recognizing them may be fun -- if "fun" can be used about a house that drives its inhabitants to kill -- but not realizing that they are references to the (probably not) true story doesn't take away from the story. 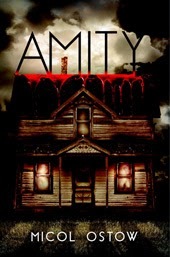 A reader can happily read Amity with no knowledge whatsoever about the Amityville Horror -- well, as "happily" one can be reading with growing dread and worry, knowing that something bad is going to happen to the inhabitants of Amity. Yes, it's months away -- but trust me. Your lovers of horror will not be disappointed. Now that Ostow has told modern versions of Charles Manson and the Amityville Horror, what next? Me, I'm hoping for her to turn her attentions to Jonestown. I still have nightmares about that one. oh my gosh...want this book! Sounds like a buyer (well, not for my k-3 school) but for sure for me...love a good book scare. thanks! I've been looking for a little horror collection, I used to read horror all the time but stopped recently, it's hard to find good horror. Hopefully this gets me back into the genre that got me reading as a kid.